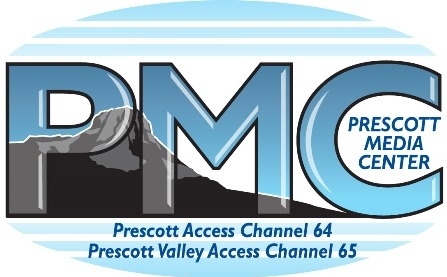 Open Mon-Fri 8:30 a.m. - 5:30 p.m.
PCAC - Prescott Media Center is the Prescott area's own local PEG Channel (Public - Education - Government) Our channel is exclusively available on Channel 64 for Cable One subscribers. We are here to provide you with local government programming, as well as the equipment and training to make programs for cable television. We also accept pre-produced, non-copyrighted material from community members. Please see our terms and conditions of cablecasting on this site to make sure your program meets the criteria. PCAC Inc (Prescott Community Access Channel Incorporated) is a 501(c)(3) non-profit who contracts with The City of Prescott to provide coverage of City of Prescott government meetings, forums and other local events, as well as provide the public with the resources to produce non-commercial television programs. Our funding comes from a percentage of the cable franchise fee, memberships, video bulletin board, underwriting and donations from viewers like you. Prescott Media Center airs public, educational, and government programming in the Prescott cable franchise area.